Innate immunity is the body's first line of protection against potential microbial, viral, and environmental attacks, and the skin and oral mucosa are two of the most powerful barriers that which we rely on to stay well. 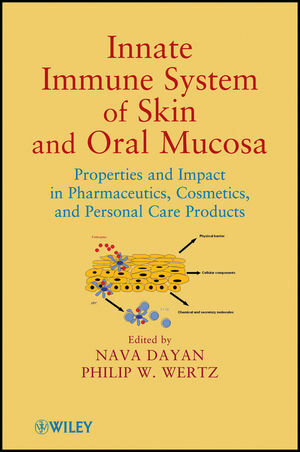 The definitive book on the subject, Innate Immune System of Skin and Oral Mucosa: Properties and Impact in Pharmaceutics, Cosmetics, and Personal Care Products provides a comprehensive overview of these systems, including coverage of antimicrobial peptides and lipids and microbial challenges and stressors that can influence innate immunity. Designed to help experts and newcomers alike in fields like dermatology, oral pathology, cosmetics, personal care, and pharmaceuticals, the book is filled with suggestions to assist research and development. Looking at the many challenges facing the innate immune system, including the impact of topically applied skin products and medications, Innate Immune System of Skin and Oral Mucosa paves the way for next generation treatment avenues, preventative approaches, and drug development. Nava Dayan PhD, is the R&D Director at Lipo Chemicals Inc. and an Associate Adjunct Professor in the Ernest Mario School of Pharmacy at Rutgers University. During her twenty four years of experience she has specialized in a variety of areas related to skin treatment, especially in the research and understanding of the interaction between topically applied compounds and the skin. Dr. Dayan has received numerous awards for excellence for various papers she has authored. She is the author and coauthor of more than a hundred and fifty publications, including book chapters, and has been granted eight patents. She is also the editor of three books, including Formulating, Packaging, and Marketing of Natural Cosmetic Products (Wiley). Philip W. Wertz PhD, is a Professor in the Department of Oral Pathology, Radiology, and Medicine at the University of Iowa College of Dentistry and in The Dows Institute for Dental Research. He is currently on the Editorial Advisory Board of the International Journal of Cosmetic Science and the Editorial Board of the TransDermal and Journal of Lipids.